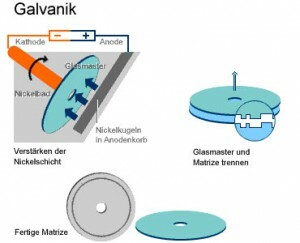 Industrial manufacturing is highly standardised. 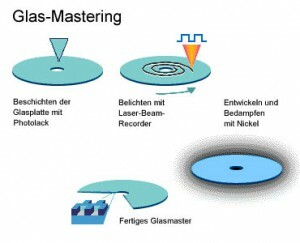 Our DVD manufacturing services give you the most cost effective option for your replication job. Manufactured DVDs are durable, reliable and have an immaculate appearance. Silk-screen or offset-print with up to 6 colors give the perfect finish to a professional product. DVD-5 holds a data-layer with a storage-capacity of 4,7 GB. It is the smallest one within th DVD-family. With two superimposed layers the DVD-9 provides a capacity of 8,5 GB, and DVD-10 up to 9,4 GB. A third layer is glued upside down onto the dual layers. 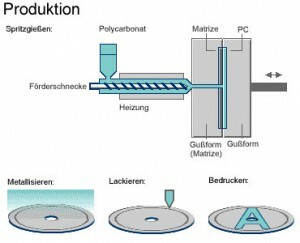 Similarly DVD-10 has two sides like a vinyl-record and only the inner-ring is available for printing . 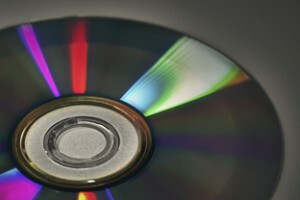 DVD means, „Digital Versatile Disc“. Its format capabilities are even more extensive than the CD’s. Additionally it provides a better data-performance and a higher storage capacity. Just deliver us your pre-master as DVD-R or DLT-reel and ensure the medium is clean and unscratched – and we will take care of the rest. Any questions regarding formats? – Please contact us! Do you require information about programming DVD-menues? Do you need a small amount of DVDs made quickly? We suggest our small series! A DVD-R as pre-master is the best choice if you need to produce DVD-5’s. Alternatively, an uncompressed DLT (digital linear tape) in 10 GB format. Tape Layout DDP 2.0 (disc description protocol). DDP 2.0 consists of DDP Files plus a Disc Image File. 1 DLT Tape would be required for each information layer (DVD-page or layer). For the production of a DVD9, 2 DLT Tapes in DDP 2.0 protocol are required. The tapes should be prepared in such a way that they represent a single unit and should be labelled accordingly. For the mastering process, the tapes should be labelled as Layer 0 / Layer 1 and it should also be clear whether the data layout for the 2nd layer is in Parallel (PTP) or Opposite (OTP) trackpath mode.